After a few days away it was time for a tour, to see what has changed. The temperature has been on the cool side, so there hasn't been much growth in the vegetable garden, although the potatoes are poking through the ground now (and the weeds seem to be burgeoning). 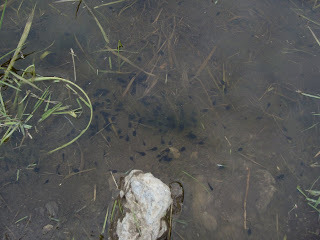 I somehow missed the frog-spawn phase, but we now have tadpoles by the hundred in the temporary pond in front of the vegetable garden. This area of water is shrinking fairly fast (the streams are drying up quickly now), so it will be touch-and-go whether these little tadpoles make it to frog-hood before their pond dries up. 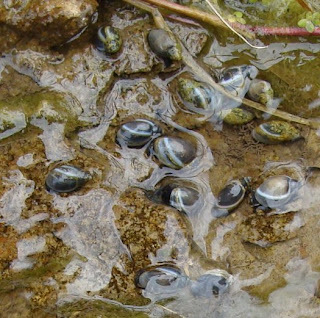 In the stream a number of tiny water-snails had appeared, cleverly disguised as small grey pebbles. I haven't been able to find out what species they are. 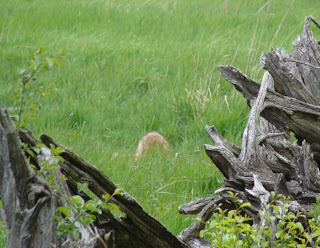 Up beyond the pond we spotted something furry moving around in next-door's field. Baby deer? Fox? Racoon? 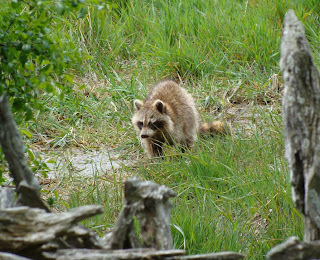 I've mainly seen racoons at the roadside at night-time, so wasn't really expecting it to be one. 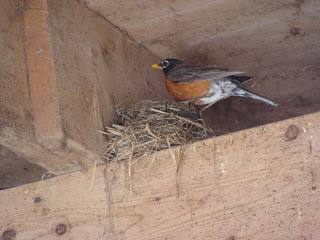 They're generally viewed as a bit of a nuisance round here, but I was thrilled to be able to get these photos. 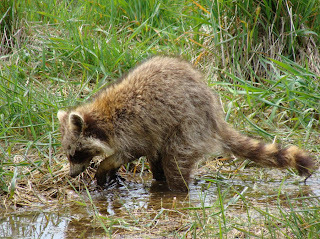 As an England dweller - the racoon looks really exciting! And - when I was glancing down the page before reading it - I was fooled by the snails. I was surprised that you had gone to the trouble of buying beautiful matching pebbles to put in your pond!